The International Famine Commemoration for 2017 took place in Ireland Park Toronto on Tuesday 24th October. 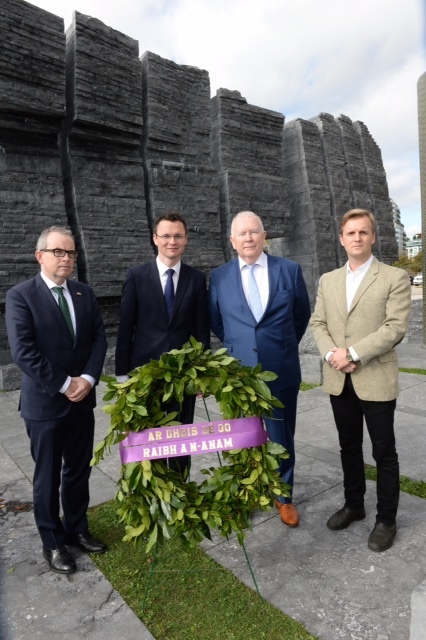 Ireland Park, which marked its tenth anniversary earlier this year, was the first overseas commemorative event to be organised by the National Famine Commemoration Committee in honour and memory of those who emigrated and took to the seas during An Gorta Mór. While in Toronto Minister O’Donovan also visited the site of the new George Robert Grasset Park which is being developed by the Ireland Park Foundation. The park which is located on the site of the Emigrant hospital will commemorate the sacrifice of many remarkable individuals who died while tending to the sick and dying Irish migrants in Toronto during the summer of 1847. Dr, Grassett himself died at age 36 in July, 1847 of fever contracted while treating victims of the Famine. This is the third International Famine Commemoration to be held in Canada. Toronto also hosted the first commemoration in 2009 while the 2015 Commemoration was held in St John. New Brunswick.